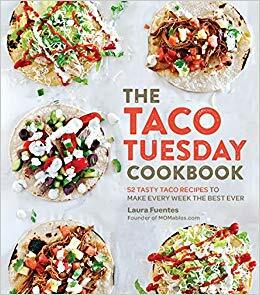 If you love tacos (and who doesn’t), the Taco Tuesday Cookbook is for you! 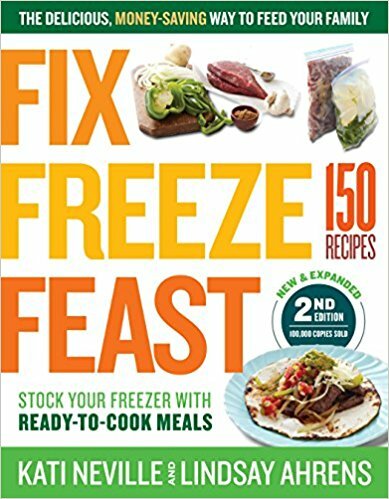 Filled with 52 taco plus guacamole, salsas, seasonings, beverages and tortilla recipes, this cookbook has something for every taste. Starting with eight easy breakfast tacos, the author includes tacos made with chicken, pork, beef, fish and shrimp. There are also eight vegetarian choices like Blackened Zucchini Tacos and Curried Cauliflower Tacos with Pineapple Salsa. If the thought of eating Mexican tacos every Tuesday for a year doesn’t appeal, don’t worry. There are Jamaican Jerk Chicken Tacos, Asian Thai Rib Tacos and Philly Cheesesteak Tacos. Skillet Beef Tacos and Food Truck Tacos are available for the traditionalist too. Overall, there is plenty of variety here. Most of the recipes take 20-30 minutes to cook though there are recipes using a slow cooker too. I picked up the Taco Tuesday Cookbook because I’m gluten-free and corn tortillas are much tastier than most of the gluten-free breads. Even though some of the recipes call for flour tortillas, the author has included a gluten-free “flour” tortilla recipe or store-bought corn tortillas could easily be substituted. All the recipes include pictures that look delicious! The only flaw is no nutritional information is included. Still, this book is recommended for home cooks looking for fast and easy weeknight meals. 4 stars! Thanks to Fair Winds Press and NetGalley for an advanced copy. 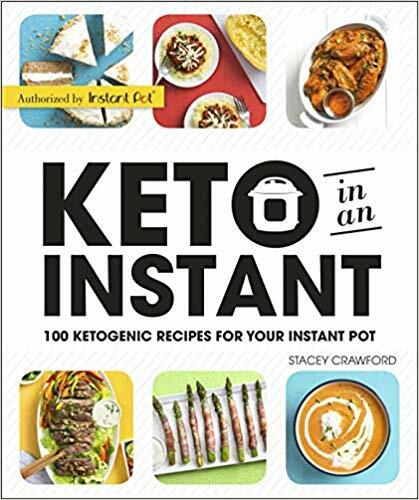 Filled with 200 recipes from breakfast to dinner to dessert, who knew cooking with an Instant Pot could be so simple. 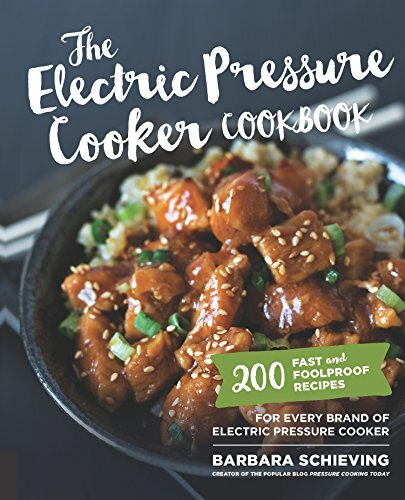 The Electric Pressure Cooker Cookbook is a great resource for those people lucky enough to own an Instant Pot or other brand of electric pressure cooker. The author explains that the recipes can also be easily adapted for a stove top pressure cooker too. The recipes are easy to follow and include only ingredients most pantries will have on hand. The introduction includes a very nice discussion about how the appliance works. The best part, of course, are the recipes. Who can resist trying Triple Chocolate Cheesecake, Coq au Vin or Beef Stroganoff made quicker and easier within an Instant Pot? Or cooking dried beans for truly homemade Red Beans and Rice in only an hour? Yum! The recipes all sound delicious. Having the index organized by main ingredient (i.e., beef, chocolate, zucchini) makes it easy to see what options are available based on what the reader has on hand. Their are many vegetarian and gluten-free recipe options though there is no labeling of the recipes. The only drawbacks are there is no nutritional information provided and pictures are infrequent. I tried a few of the recipes (Corned Beef and Cabbage, Red Beans and Rice, Quick Turkey Chili) with excellent results. 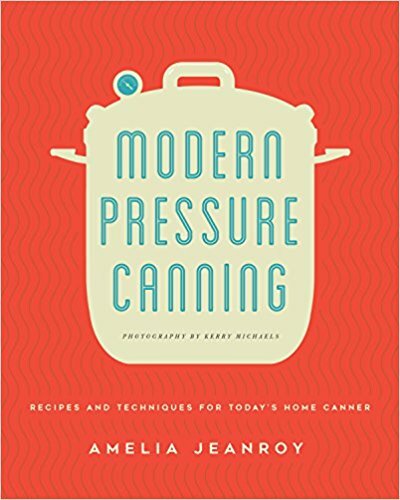 I highly recommend this cookbook for both experienced electric pressure cooker users and newbies like myself. Thanks to the publisher, Quarto Books-Harvard Common Books, and NetGalley for an advanced reader copy. 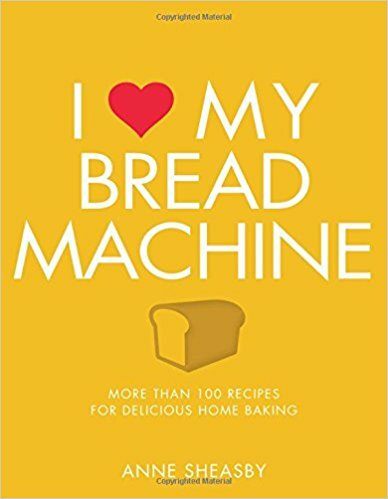 I Love My Bread Machine contains 176 pages of yummy photos and 108 delicious sounding recipes. The book contains traditional white and wheat breads and so much more. The recipes includes breads and rolls that are kneaded by the bread machine but shaped by hand and then baked in an oven. Those breads include flat breads like pizza, naan, pita, and focaccia as well as bagels. There are also quick bread recipes, using baking powder rather than yeast, where the ingredients are combined outside the bread machine and only the baking function of the machine is used. These recipes include gingerbread and a fruit & spice bread that looks like a lighter fruit cake as well as a variation on banana bread. One chapter includes many breads from foreign lands such as French brioche, Italian panettone, and English lardy cake in addition to the familiar doughnuts and English muffins. There is an entire chapter devoted to teabreads and teacakes. 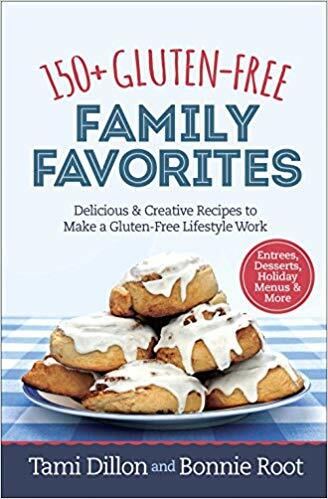 There is another containing ten gluten-free bread recipes that are variations on regular breads from earlier chapters. There is also an extensive introduction with tips and tricks for both using a bread machine and adapting personal recipes for bread machine use. Before reviewing cookbooks, I always try to make a few of their recipes. Using my old faithful Sunbeam bread machine purchased at least twenty years ago, I started with the two simplest white and wheat breads. They looked beautiful up until the end of the baking cycle when they fell like a volcanic caldera. They still tasted delicious but it is hard to make a sandwich with 3″ tall bread. I thought there might be an issue with my bread machine so I cooked my favorite white bread that I have been making for years and it baked fine. So while I Love My Bread Machine’s recipes look delicious, they obviously won’t work in every bread machine. In addition, I’m not sure of the benefit of cooking quick breads in a bread machine rather than in a pan in an oven–possibly a broken oven or a hot day where the oven would heat up the house? For these reasons, I’m giving the book 3 stars. Thanks to the publisher, Nourish Books, and netgalley for an advanced review copy of this book in exchange for my honest review. This book was published on September 19, 2017. Great discussions of books and fantastic illustrations. 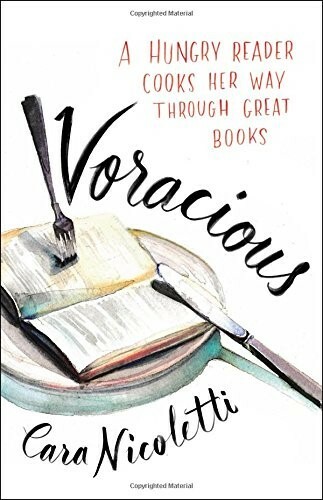 I selected Voracious: A Hungry Reader Cooks Her Way Through Great Books for the recipes but I loved it for the stories about each book. Most of the recipes are way too advanced (or just too much work) for me. However, the stories of the author’s perceptions of the books were insightful. I never even noticed most of the foods when I originally read many of the books. 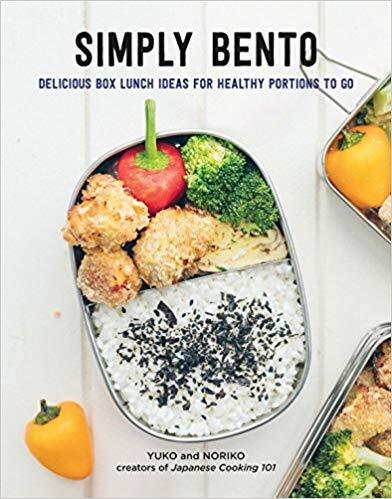 Only if the book’s plot involved a particular food, like Les Miserables, Great Expectations and The Silence of the Lambs, did I recall the food connection. But I believe that I will be paying closer attention in the future due to this author. As I said, most of these recipes are very complex. But I did learn how easy it is to make homemade ricotta, an excellent rib-eye steak or a terrific toasted cheese sandwich. Even some of the “bleak midwestern foodscape” related to The Corrections encouraged me to Google “Jello Pretzel Salad” as I still recall my Illinois grandma serving a horrendous green jello mold filled with raw cabbage in my childhood. Luckily, the pretzels aren’t somehow suspended in jello but used as a crust for a fairly delicious looking (4.5 stars on most online sites) Strawberry Jello Pie. I could totally see myself making that some hot summer day. 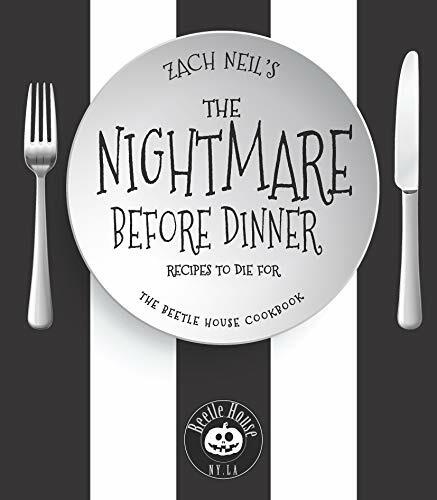 This cookbook memoir made me think about what side topic I most remember in the books I read. I decided quickly that it was the illustrations, either on the cover or if I was lucky also within its pages. This book is no exception. Most cookbooks come with photographs but I really enjoyed the paintings of the food (usually only some of the ingredients) within this book. The peaches, avocados and cupcakes made me hungry they looked so delicious. Yum! 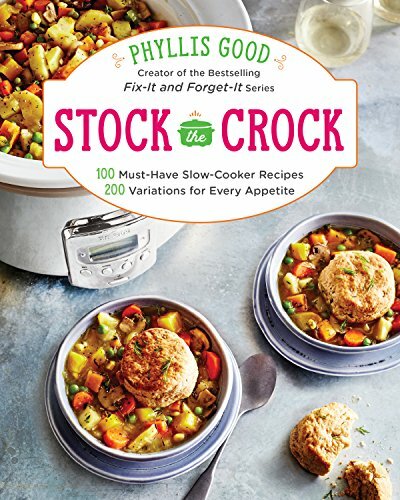 Good variety of recipes that can be cooked in either a crockpot or Instant Pot. 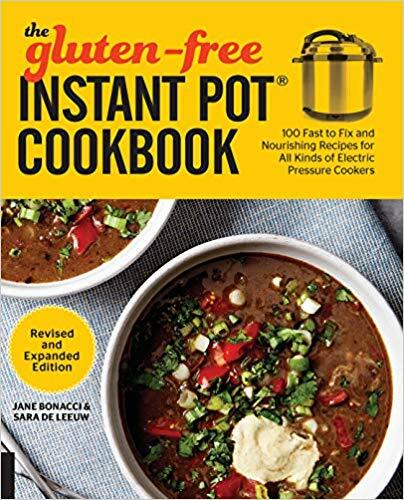 This cookbook has 100 crockpot recipes and each have many variations for gluten-free, paleo, ‘picky eaters’ (i.e. less spicy) or vegan diets. The accompanying photographs look scrumptious. There are many unusual recipes including tomato paste, cream of mushroom soup, fruit butters, yogurt, fruit crisps and other desserts. There are some unusual vegan substitutions like pan cooked lentils for ground beef that I am going to try soon. 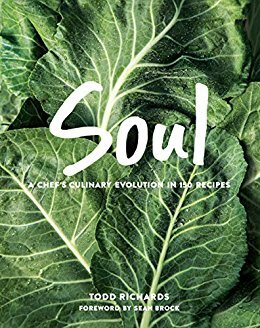 The author also includes some excellent cooking tips that I have never heard elsewhere despite my addiction to the Food Network. My favorite was putting cut potatoes in a water and cream of tartar bath before cooking to avoid them turning brown while cooking, which worked great when I tried it. 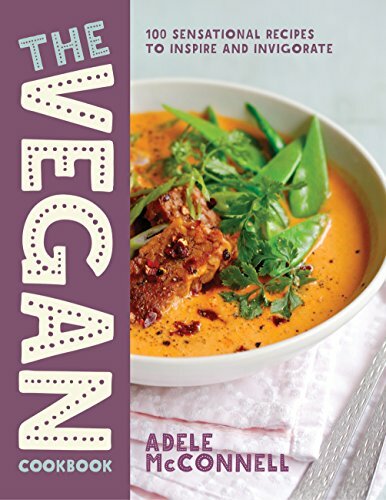 I will use this tip in many of my family’s recipes–not just the ones in this book. The recipes don’t have exotic ingredients or spices that you have to make a special trip to the store to buy. Most of the ingredients would be in a typical family’s fridge or pantry. I liked that the author included substitutions for items you may not have on hand, or just don’t like, along with any timing differences that might be required. The two dishes that I prepared were simple and tasty. I’m looking forward to trying a few more soon. I only have one complaint. There is no calorie or nutritional information with any of the recipes so I deducted one star for that oversight. However, I would still recommend this book. I want to thank the publisher, Time Inc. Books, and netgalley for the advance reader copy in exchange for my honest review. This book will be released on September 5, 2017.